The Rain Blocker jacket is a new and innovative design that provides coverage like a four legged suit but with the ease of use of a jacket. The front leg sleeves have snap buttons at the cuff to ensure optimal fit for all thicknesses of legs and will prevent your dog pulling their legs up into the sleeves. 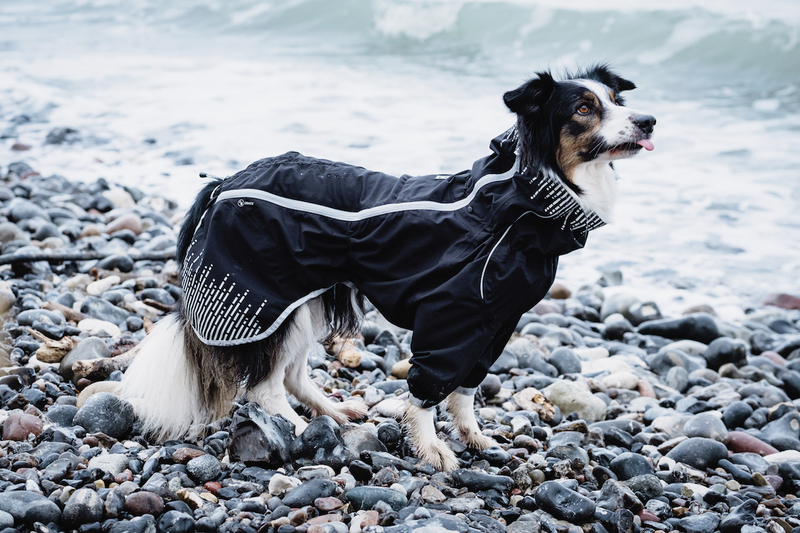 The high collar protects the dog all the way to the ears and the built in rain catcher prevents rain from entering the coat along the dogs neck. Adjustable back length as well as waist and neckline for optimal fit. Powerful 3M reflectors placed around the coat ensures your dog is visible in the dark from every angle. Soft elastic leg straps keep the coat in place on even very active dogs and in windy weather. Opening on the back to attach a leash, so your dog can wear a harness underneath the jacket. This coat keeps your dog dry and clean and therefore your house stays clean as well. The fabric is rustle free and has taped seems. The environmentally friendly Hedge coloured ECO version is made from 100% recycled polyester (ECO) in accordance to the Oeko-tex standard 100. You can read more about the Oeko-tex standard here. In stock in Raven, River and Hegde (ECO) in sizes 12" to 28"
The back length is the most important measurement needed when choosing which size your dog needs. Please measure from the withers (very base of the neck where it meets the shoulder blades) to the base of the tail. Then measure the circumference of your dogs chest, right behind the from legs, to ensure the coat will fit in the chest area. You should allow for at least 2" of room to move, preferably more on dogs with longer coats. Q: How long is the neck on the 14" size? I have a poodle and would love to be able to keep his head dry. The neck is approx 6", but it's not designed to go up over the dogs hears and head. Q: Hi, Will this jacket keep my dog's belly dry in very rainy weather? She's a border collie/ australian shepherd mix and her long fur just soaks up the water. I'd like to cover as much of her as possible when it's really raining out. If this jacket doesn't fit the bill, can you recommend another that would? Thank you!